In Jerez right now the jacaranda trees haven’t yet begun to bloom, but already the heavy buds are forming. 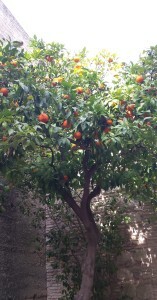 There is still blossom on the orange trees and their perfume is intoxicating. A ‘patio de los naranjos’, the regular spacing of orange trees within a pavement of tiles or paving stones, often patterned, is a common feature in Andalucian building design. In Jerez there are many, but two public versions are in close proximity, at least in spatial terms. Last week I visited both. 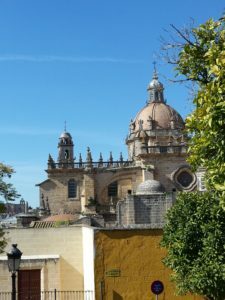 The first is outside the Alcazar, the Moorish citadel, on a terrace over-looking the cathedral of San Salvador. Here, twenty orange trees or more grow, spaced equidistant in the buff and red coloured, diamond-patterned pavement. Technically, this isn’t a ‘patio’ at all, as it isn’t enclosed, but it fills a clearly defined space, in front of the massive Alcazar walls, but before the hill-side falls away, necessitating a terracing down towards the Cathedral. The planting is modern, but the tradition is a very old one. The Alcazar itself, though the walls which you now see are twelfth century, goes back to Ummayad times and the ninth and tenth centuries. 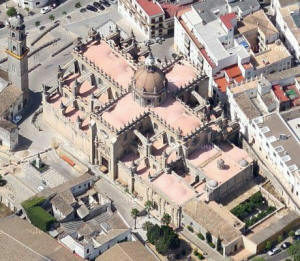 It is inside the walls of the Cathedral that one finds the second patio de los naranjos. 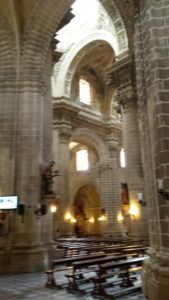 The former collegiate church, now Cathedral, of San Salvador, traces its lineage ( if not its stones ) back to the Christian conquest of Jerez by King Alfonso X in October 1264. It was he who established the Chapter, which was already in place by September 1265, with an abbot and canons in post. The current building was commissioned in 1695 and it was begun by Jerez master builder, Diego Moreno Melendez. Three successors and over eighty years later, it was consecrated in December 1778. 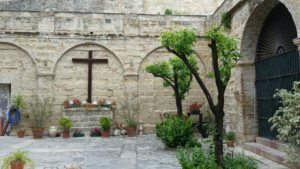 The Patio de los Naranjos is at the rear of the Cathedral, a walled garden outside the main structure. It was calm and sun-filled last week, a sanctuary from the blustery wind. 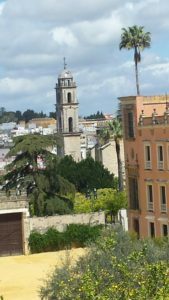 Both Alcazar and Cathedral are open to the public and are well worth a visit. Entrance costs 5 euros for each ( although there is a small extra charge if you want to take part in the ‘city tour’ using the camera obscura in one of the castle towers, which is both interesting and informative, and in a variety of languages ). Details of opening times can be found on the Alcazar and Cathedral web pages.